You may be forgiven if the name George Scott fails to ring any bells in connection with Liverpool, Shankly, and those famous glory days of the sixties and seventies. However, here is a man who was an unseen 'cornerstone' of the fabulous cathedral that is Anfield. George Scott emerged from the tunnel onto the Wembley pitch and into a wall of sound. "I remember walking up the Wembley pitch with Bill Shankly, Bob Paisley and Peter Thompson an hour and a half before the game. Bill looked at the masses of Liverpool fans behind the goal and said to Bob Paisley. “Bob we can’t lose for these fans, it is not an option” The hairs still stand up on the back of my neck today when I think about it." The date was May 1965, and that afternoon, Liverpool Football Club was about to claim the F.A. Cup for the first time in its history. "In January 1960 at the age of 15 I travelled to Liverpool from Aberdeen to sign for Bill Shankly as one of his first young players. I remember getting off of the train at Lime Street Station and being met by Joe Fagan who was then the youth team coach. We got in a taxi and drove up the famous Scotland Road where Joe told me there was a pub on every corner and not to visit any of them ever. We soon arrived at 258 Anfield Road where I was to share lodgings with two other apprentices, Bobby Graham and Gordon Wallace, both of whom later went on to play in the first team. My first wage as an apprentice professional was £7.50 per week of which I gave £3.50 to my landlady for my lodgings and sent £2.00 per week home to my Mum in an envelope to help the family out. I was left with £2.00 per week which was enough in those days for a young man to have a great time for a week in Liverpool, including being able to watch the Beatles start their career playing live in the Cavern in Mathew Street. In May 1961 outside the secretary’s office I found a complete record of the week’s wages to be paid in to Barclays Bank in Walton Vale for every player and member of staff at Anfield. Unbelievably the total wage bill for every player and all of the coaching and managerial staff in the Liverpool Football Club was five hundred and thirteen pounds, thirteen shillings, and two pence old money. After a two year apprenticeship, I signed full time professional forms on my 17th birthday on October 25th 1961. I made my reserve team debut along with Tommy Smith, Chris Lawler, Bobby Graham and Gordon Wallace as part of a very young Liverpool reserve team in the semi-final of the Lancashire Senior Cup against Manchester United reserves at Old Trafford in 1962 playing against some great old United players such as Albert Quixall, David Herd, Jimmy Nicholson, David Gaskell, Barry Fry and Noel Cantwell. Alongside Tommy Smith, Scott became a key member of the 62-63 youth team, helping them to reach the final of the youth cup were they were beaten in a high scoring encounter by a West Ham side aided and abetted by one Harry Redknapp. Scott's goalscoring performances saw him progress smoothly to the reserve side. "During the next three years 1963, 1964 and 1965 I went on to make 138 appearances in the reserve team at Anfield, scoring 34 goals." Scott was destined not to make the starting eleven on the historic day in 1965 when Liverpool won the FA Cup for the first time. Keith Peacock's appearance as the first ever substitute to see action in British football was still some three months away but Liverpool's 12th man, on that never to be forgotten spring afternoon, had good reason to look forward to the coming season as the one in which he would make his longed-for breakthrough. After three profitable years plundering goals in the Central League George Scott was on the brink of the first team after a run of form that had taken him within an ace of the '65 cup winning team. "I can still remember the train journey home. We celebrated and drank champagne out of the cup and from Crewe onwards you couldn't see any buildings for the flags and banners. At the Town Hall reception Shanks addressed the mass of people who had come out to greet us and the noise was terrific. There must have been half a million people in the streets of Liverpool that day. I stood behind Shankly on the town hall balcony as he made his speech to the thousands of supporters congested in to Water Street below and it was absolutely electrifying. At the time I was in digs with the great Liverpool winger Peter Thompson and when we eventually got home to our digs that evening I found a letter from the club waiting for me from Mr Shankly. I opened it thinking that I had been permanently promoted to the first team squad and that 1966 would be my big breakthrough year. I was brought right back to reality when I saw that the letter stated that at a board meeting of the Directors of Liverpool FC it had been decided to place me on the transfer list." "On the Monday morning I barged into Shanks' office distraught. He could see I was upset and asked me what was wrong. 'I've come to ask you about this', I said, and Shanks asked me what I was talking about. I showed him the letter and said: 'I'm the leading scorer in the reserves and I've just been to Wembley.' He replied, 'Pay no attention to that letter, son.' I was puzzled. Here I was absolutely shattered and Shanks told me not to worry. Then he added, 'I'll give you five good reasons why you should leave this club.' 'Five,' I thought, what's he talking about? 'Callaghan, Hunt, St. John, Smith and Thompson' said Shanks. 'If you want to progress, it's time to go.'" It's a moot point whether Shankly, knowing the board were letting Scott go, deliberately made him 12th man in the cup final to soften the inevitable blow that was to follow. Certainly, he was full of understanding and sympathy for his young protege. "He could see I was upset and he came round from his desk and put his arm round me. 'George, I want you to always remember that at this particular time you are the 12th best player in the world. Now go back to Aberdeen and prove it.'" Scott had gone into the office devastated and received confirmation of what he had dreaded, yet had come out feeling 10 feet tall. "It wasn't just the words, it was the total conviction in the way he delivered them that had the effect. Another thing he said to me was 'You're like the cornerstone of the Anglican Cathedral. Nobody ever sees it but without it the cathedral doesn't get built.' He was referring to the fact that I was one of his first signings. I don't know how he thought these things up, or whether they were off the cuff but he knew how to deal with people." Liverpool had agreed a £12,000 fee with Aberdeen to transfer George Scott's services and Scott found himself back at the club he had initially turned down as a schoolboy to join Liverpool. 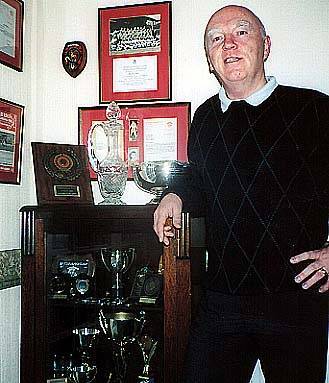 "Shanks had been on the phone to the Aberdeen manager Eddie Turnbull and done a real sales job on me. I was happy to go to Aberdeen as it was my home town club. "In hindsight, the pivotal moment of my career came in the summer of '63. Liverpool went to the U.S. for a pre season tour and I'd got all kitted out with a club suit and so on. Then I got injured just before we flew out. Shanks was disappointed and told me I had to stay at home. He went and bought Phil Chisnall from Man Utd and I think really that was the moment my big chance came and went." Scott's contemporaries from the youth and reserve team years, Smith, Lawler, Graham, Thompson, Byrne, Arrowsmith had all made it to the first team yet through a combination of bad luck and a lack of opportunity, Scott never did.